GREAT CAPACITY HOLDS 40 SINGLE SERVE COFFEE PODS Simple and elegant look, Keeps your k-cups well organized，Holds up to 40 k-cups and the coffee pod fits very nice in the unique slots. 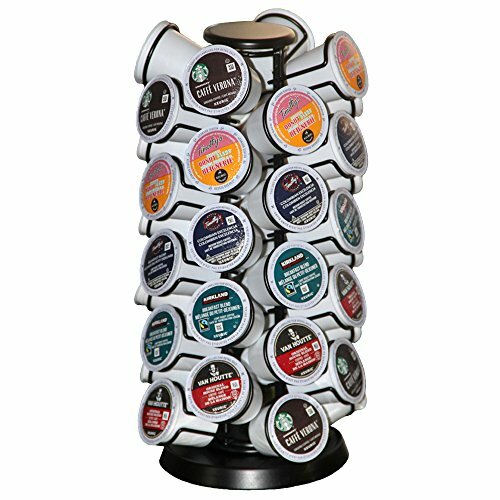 360 DEGREE REVOLVING BASE VERY EASY TO ACCESS ANY COFFEE POD Large knob on top, Spins smoothly with just a touch, Very convenient to access any flavor of coffee. ULTRA SPACE SAVING Small footprint (6-1/8" Width x 6-1/8" Depth x 13-1/8" Height), Takes less space than most of other carousel holders. CLASSIC MATT BLACK FINISH Compatible with any single cup coffee maker, A very nice accessory to hold your k-cups. Perfect for the countertop next to your Keurig or icoffee. If you have any questions about this product by Blacksmith Family, contact us by completing and submitting the form below. If you are looking for a specif part number, please include it with your message.